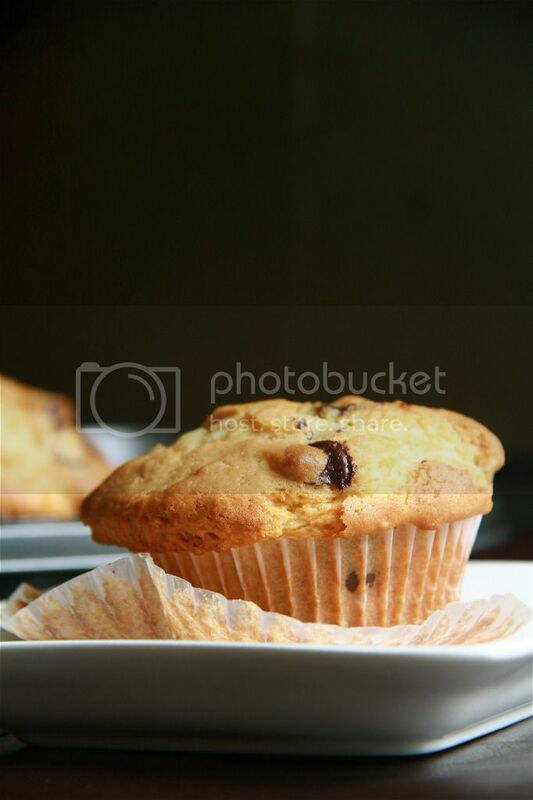 Crumbs and Cookies: crunchy-top chocolate chip muffins take 2. It was with much regret that I chose to bake this same recipe in those paper liners last time. I ended up with muffins that had too little crunchy surface area. I promised myself that I would make these muffins again, in their rightful muffin tin, so that I could have more of that droolicious muffin top. So here they are! I talked about my ideal muffin before. Basically, I wanted a muffin that expands upwards and outwards, instead of just aiming for the sky. To achieve this aim, I tweaked this recipe a bit, adding baking soda as another leavening agent. I didn't do any proper research, but I remembered reading that baking soda helps the baked good to spread outwards. I think it applies for cookies. I wasn't sure if it would apply for muffins but I tried it out anyway. 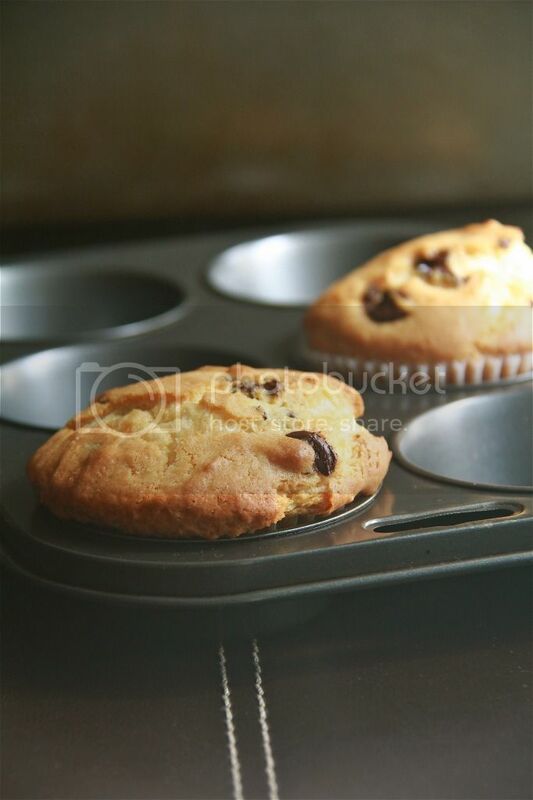 Therefore, my conclusion for large, flat top muffins is to bake them at lower temperatures. Another reason that is hampering my goal of a large, flat muffin is, I guess, the use of too much flour. 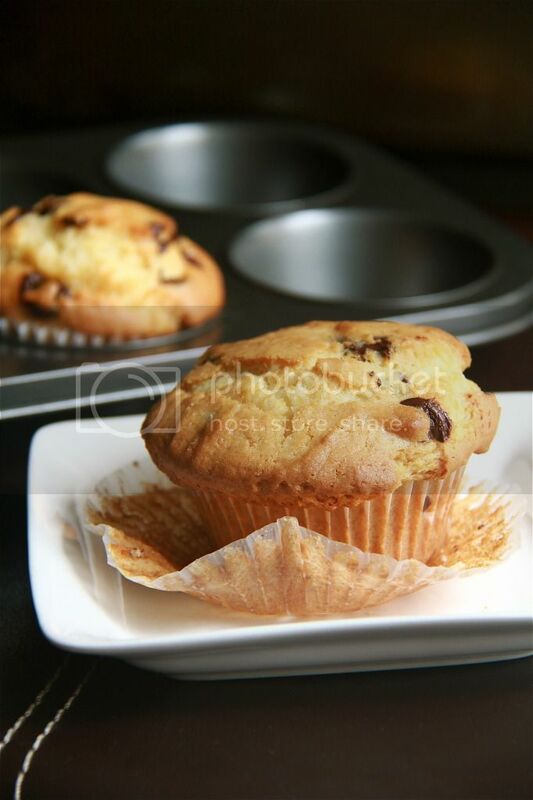 To make a really high rising muffin, more structure than usual is needed, and that's where the extra flour comes in. 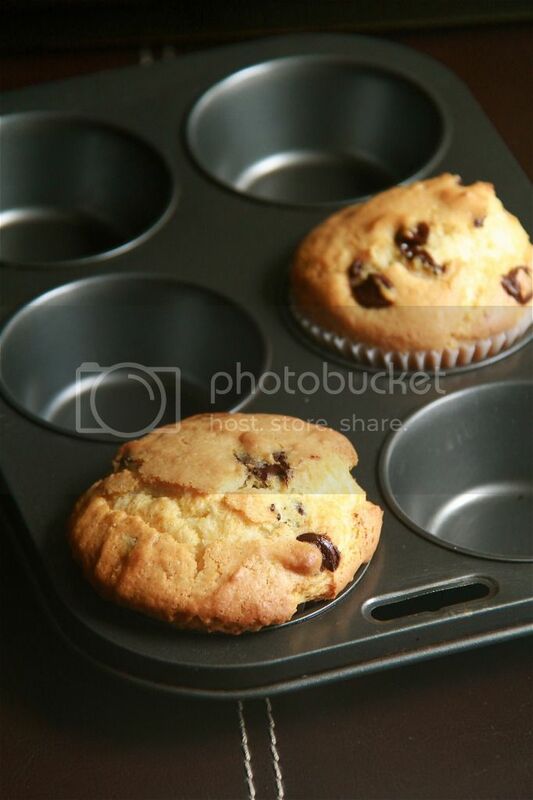 But because I'm looking for a muffin that expands vertically, and not horizontally, I don't really need that much flour. In fact, a looser batter may be preferred as it does not make the leavening's job as hard as a stiff batter would. Too stiff a batter, especially with my preferred method of mixing (which includes the whipping of eggs), would most probably result in a dry muffin. These muffins actually turned out on the dry and crumbly side. I could have overbaked them slightly, but this problem was already prevalent in my previous batch. Second conclusion- a looser batter by using less flour or more liquid. Hopefully, with these guidelines I can be a bit closer to my perfect muffin recipe. Watch this space.